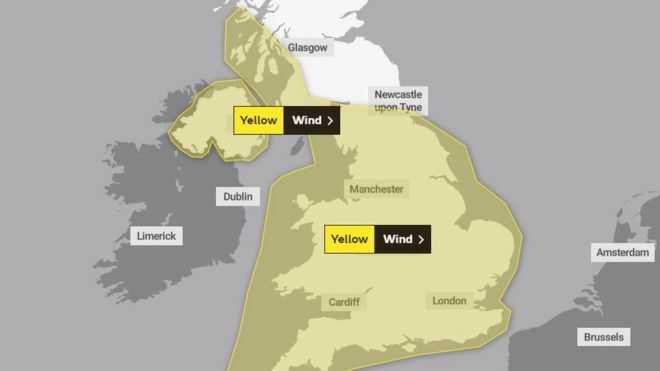 A YELLOW WEATHER WARNING has been issued for Wales as Storm Gareth and extreme winds hit the country. The Met Office has warned of strong winds today (Mar 12) and tomorrow as part of Storm Gareth. There is a yellow warning for wind in place between 12pm today and 3pm tomorrow, with strong west to northwesterly winds expected and possible transport disruption. The Met Office has described how a spell of strong west to northwesterly winds is expected to develop across the UK afternoon, extending across much of England and Wales through Wednesday. Gusts of up to 50-55 mph are likely inland and 65 mph along western coasts. Winds will gradually ease during Wednesday afternoon. People are told to expect bus and train services to be affected, delays for high-sided vehicles on exposed routes and bridges, short term loss of power and coastal routes, sea fronts and coastal communities affected by spray and/or large waves. BBC weather forecaster Derek Brockway said: “The next deep low named Storm Gareth by Met Eireann (Irish Meteorological Service) will bring high winds tomorrow evening, overnight & Wednesday. At 4.15am, the M48 Severn Bridge was closed in both directions, between junction two for the A466 near Chepstow and junction one for the A403 at Aust. Traffic was diverted via the M4 Prince of Wales Bridge, but the bridge has since reopened to cars eastbound. Flights from Cardiff to Edinburgh and Belfast were delayed. StenaLine and Irish Ferries passengers crossing the Irish Sea are advised to check on the status of their service, as trips between Pembroke and Rosslare and Holyhead and Dublin were affected.